I think most parents can relate that having a newborn is an adventure in-it-of-itself: the crying, the pooping, the inconsistent sleep, seeing their first smiles, first laughs, and challenging themselves to grow. All of this means having to be around them 24-hours a day. Now add in a sailing trip and you’ve got a whole new level adventure. 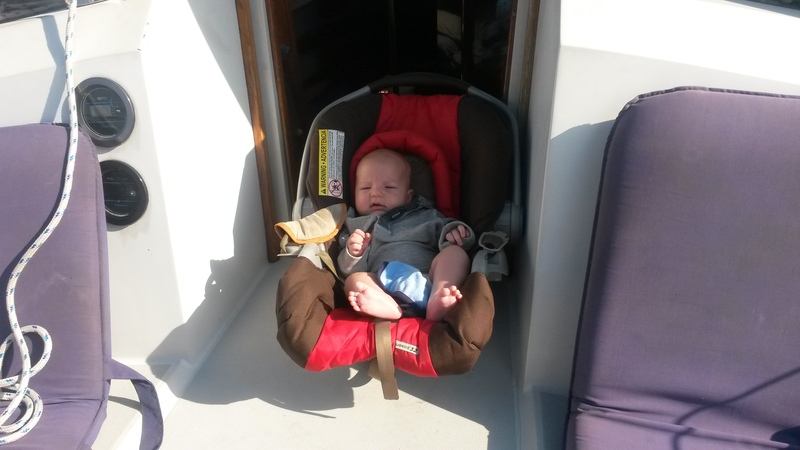 When we first boarded the boat, mini-man clung to me for dear life. He wanted to see what was going on but did not want to let go of me. Once we set sail, I took mini-man below deck to eat and play on his tummy (one of his favorite things to do). At this point he passed out from all of the excitement. The next day was amazing. We had docked in Cocoa the night before and woke up to a craft fair being held right next to the dock. We wrapped mini-man up and walked around the town for a bit. Afterwards, we hoisted the sails and sailed around the river for a bit. The wind and sun made it a great day for sailing. Mini-man had a great time. He enjoyed the breeze while playing on my lap – no more needing to cling to mommy. The last day was rough. 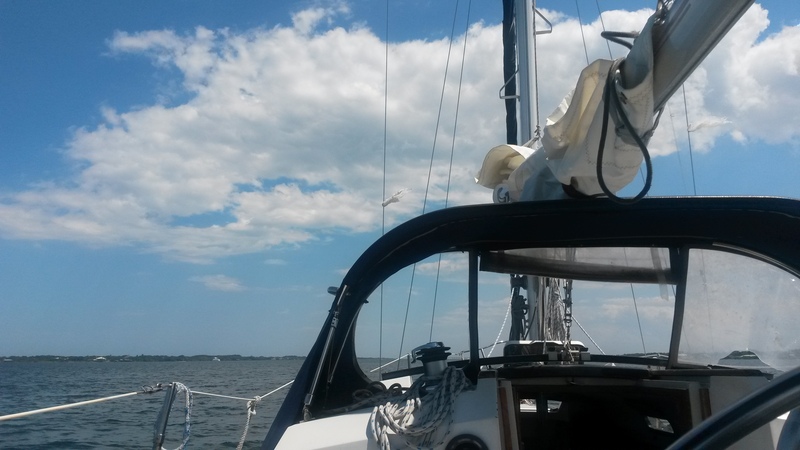 We sailed a little farther than we planned and it took a while to get back to the marina. Unfortunately, there wasn’t as much wind and it was very hot out. This makes for miserable conditions for an infant, who can get hot very quickly. Half way back he started crying from exhaustion and heat. He calmed down once we got to an area with wind, but he was still miserable. Once we docked, I headed straight to the marina’s game room – which had air conditioning. As soon as we got inside, mini-man felt better. We were able to play and eat while Damon unloaded our stuff from the boat. He was wide awake by the time we were ready to leave and played in his car seat on the ride home. At home, Colby was asleep so we all decided to take a nap. This “nap” lasted for three hours! I guess we were all tired from our first sailing trip together. 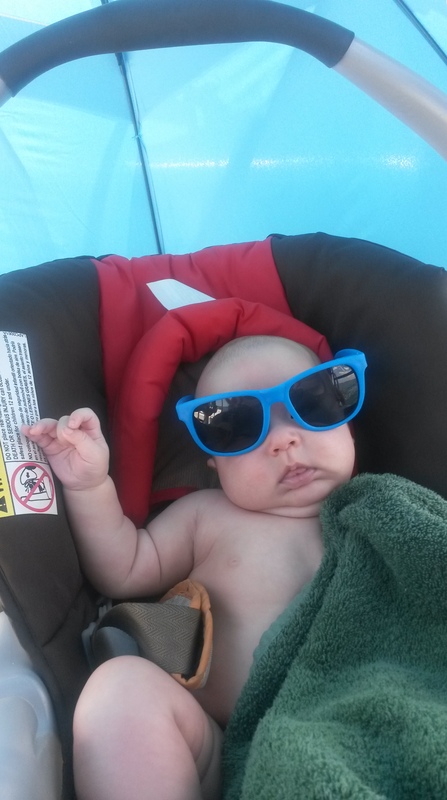 Keep your Cool: Infants can overheat very quickly. Be sure to have cold water on stand-by to create cold-compresses to lay on their back to help keep them cool. Keep Hydrated: Infants dehydrate faster than adults. Expect to feed them more often that usual to help keep them hydrated. One Person Sailing: This is a new environment for your little one and they will need an adult with them. So be prepared to sail with one person. Sun Protection: Infants can’t handle sunscreen until they are at least six months old. Protect your little one by keeping them in the shade and dressing them in long sleeves. Car Seat: This was a huge life saver for us. 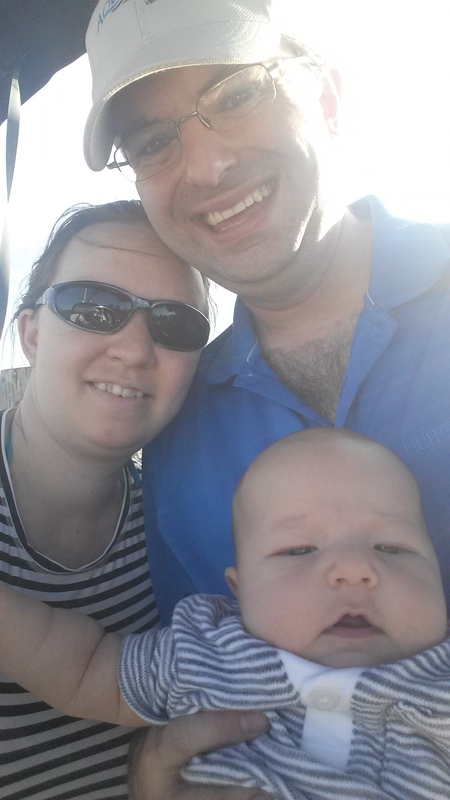 We could place mini-man in his car seat next to us – which allowed him to watch what was going on.